go back to the main raccoon page. Raccoons are predators. They normally have a fairly omnivorous diet. They hunt small mammals, crayfish, frogs, and just about anything else they can catch. 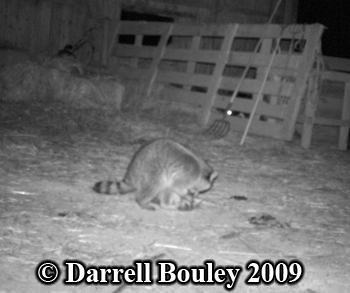 However, sometimes raccoons get into trouble with humans when they hunt our pets. 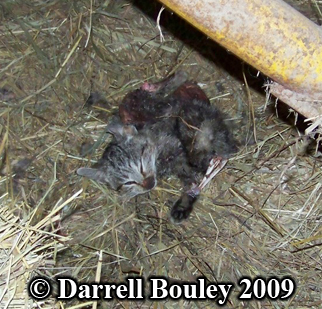 In the case below, a raccoon killed and ate 16 barn cats over a couple months. I got an email from the cats' owner asking what animal could be the culprit. The photos below tell the story. 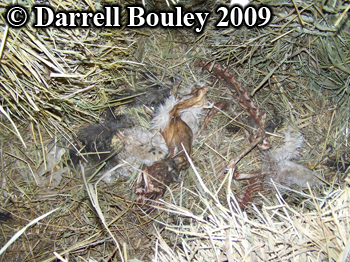 The cats were disappearing and their carcasses were being found hidden in the hay in the barn. Many cats disappeared, only to turn up half eaten. The predator would leave the bones and skin and eat the rest. Most of this cat was eaten. 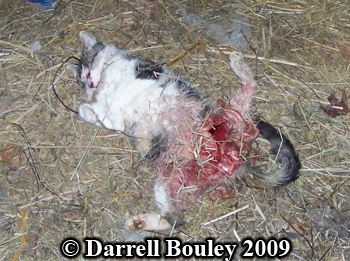 The animal that was killing the cats would feed and then leave what it couldn't eat behind. It would return later to feed again. This is the sort of behavior that many predators have. For example, bobcats tend to bury their prey and return again. This animal was not burying its kills. 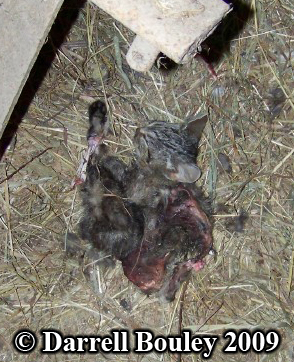 This cat was killed, but something must have interrupted the predator before it finished eating. camera in the barn, hoping to catch the culprit. 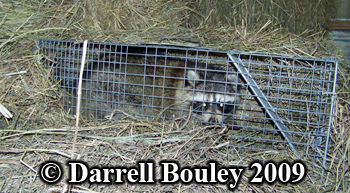 The culprit turned out to be a raccoon, who returned to feed on the cat it had killed. Raccoons do scavenge, but this was the only animal who returned to the carcass to feed. There was no doubt the raccoon was the culprit. No other tracks were found. 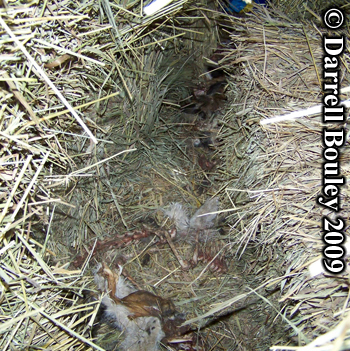 A Hav-A-Hart trap was set in the hay, baited with the carcass of one of the cats that had been killed. The raccoon was caught that night. How do you keep your pets safe from raccoons? Dogs and raccoons do fight, and raccoons are very tough fighters. Dogs are frequently injured in encounters with raccoons. 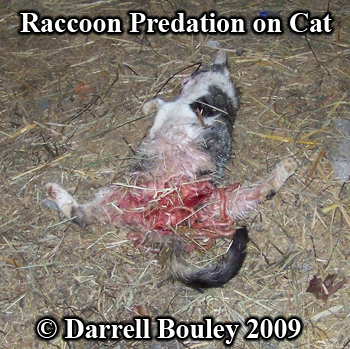 Cats are sometimes killed by raccoons. The best way to keep your pets safe is to keep them indoors at night. Unfortunately, in the case above, the cats were outdoor barn cats, not house cats. If you feed you dog or cat outside, bring in the food dishes each night. Raccoons and other animals will get into food left out at night. You don't want to encounter a skunk when you walk out your door! 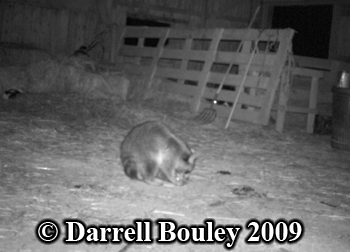 Another way to keep raccoons away is to eliminate anything that attracts them. Keep all garbage cans tightly sealed so no odors draw them in. Compost piles will also attract raccoons. (And bears, if you live in bear country.) If you cook on a backyard barbecue, be sure to clean up all food residue so the smells won't entice any unwanted visitors. 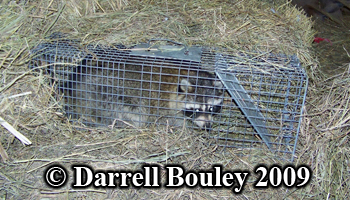 If a raccoon does become a problem and begins killing domestic animals, the Fish and Game department in many states will issue a depredation permit, allowing the owner to kill the marauding raccoon. In rural areas, they are often shot. In cities, they are trapped and euthanized in other ways. Relocating a raccoon doesn't usually work. Often, they will find their way back. Or, it will just become a problem in the area where it was relocated. As with many wild animals, they are better off if they are wild and have no contact with humans or their pets. Find raccoon posters, greeting cards, postage stamps and more in my new store. Visit my online store at: www.dirt-time.com Happy tracking!! Got a raccoon story? E-mail me and tell me about it. All counters reset in October 2000.